Note that the acorns must be soaked overnight first then rinsed. 1. Dry off the acorns and remove shells. Spread onto a baking sheet brush with sunflower oil and bake for just 10 minutes at 150 degrees or until golden brown (any darker and they will taste bitter and acrid). 2. Once cool chop three acorns finely with sharp knife and blitz the remainder in an electric coffee grinder/blender. 3. Place the sticky rice and 500ml water into a saucepan and bring to the boil. Cover and simmer gently for 10-12 mins until the water has been absorbed and the rice is just tender. 4. 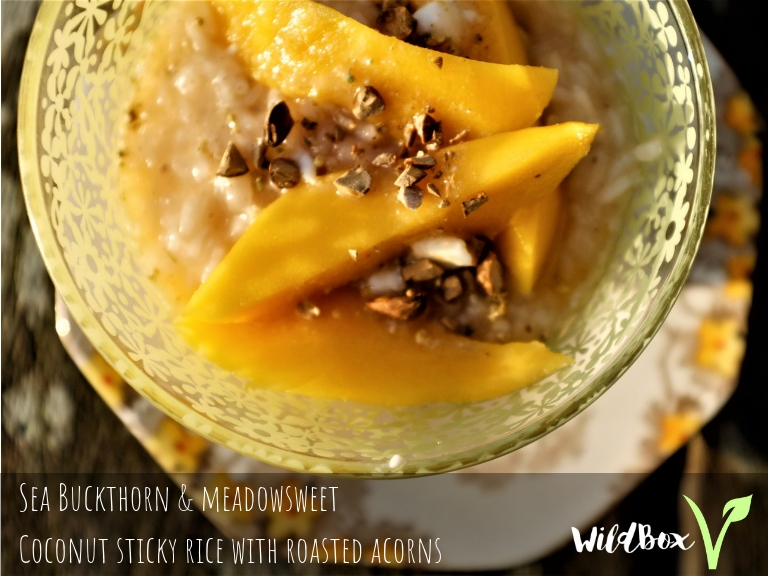 Mix the coconut milk, salt , sugar and meadowsweet together in a bowl, set aside two tbsp in another bowl. 5. Place the blitzed acorns into a piece of muslin and add to the coconut mixture which you then stir into the warm cooked rice. 6. Bring to the boil, then cover and chill for 20 minutes. 7. Stir the sea buckthorn into the reserved coconut milk mixture and set aside.